I love salads this time of the year and a favorite of mine is at Companion Bakery here in St. Louis. It’s their Picnic Salad, a spinach salad with a strawberry poppy seed dressing, chicken, candied pecans, and Blue cheese. For some reason I’m not a fan of Blue cheese anymore so when I created this I made it with goat cheese and added lots of fresh fruit to make this a colorful spring or summertime salad. In fact, after I poached my chicken, with the leftovers, made a lettuce wrap that was outstanding! I didn’t think at the time to take a photo of it so poached more chicken, but when I went to get it out of the refrigerator to plate the wrap my husband had eaten it. I guess I wasn’t quick enough. Poached chicken is so easy to make and ideal for salads since it’s so moist and lends well to soaking up whatever dressing you add to the mix. Imagine all the ingredients in this photo except the spinach, blended together, then placed in Boston lettuce leaves. It’s perfect for a light lunch, luncheon or to pack up for a picnic or brown bag lunch. Package the mix separately from the lettuce and then plate altogether when you decide to eat. Whether you make this as a full Spinach Salad or Boston Lettuce Chicken Wraps you can’t go wrong. 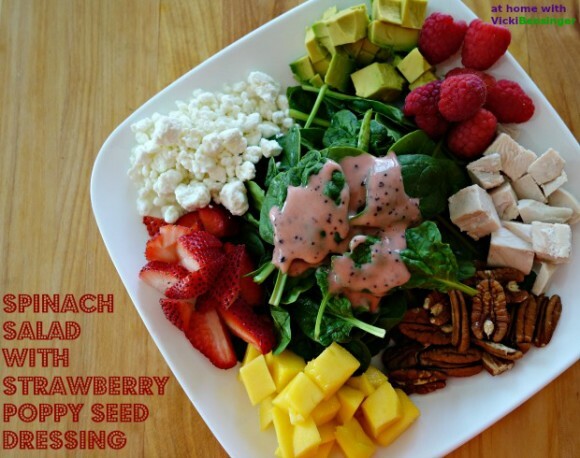 The Strawberry Poppy Seed Dressing is truly the star feature of this salad. It’s so simple to make, and should last at least a week stored in a Mason Jar or airtight container in the refrigerator – if you don’t finish it before that. If preferred use Coconut Oil instead of the Canola Oil. Try this light colorful dish as a salad or lettuce wraps. Prepare the chicken breasts: Preheat oven to 375°F. Place the chicken breasts in one layer in a baking dish with 1/2 cup water. Cover with foil and bake 25 minutes until completely cooked through. Remove cooked chicken breasts from pan, cool at room temperature for 10 minutes, then cover and refrigerate. For the dressing: To a blender add all ingredients except poppy seeds and process until smooth. Pour into a jar, then stir in poppy seeds. Cover and store in refrigerator. For the salad: Cube chicken breasts into ½-inch pieces. 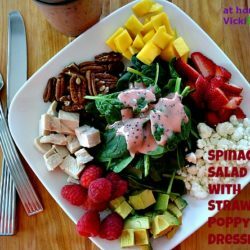 In a large salad bowl, toss together chicken, spinach, pecans, strawberries, raspberries, mangoes, avocados and goat cheese. Plate and top with dressing. Alternative: Mix all ingredients for salad except spinach and place into butter leaves and serve as a wrap. This looks like the perfect lunch or dinner to me! 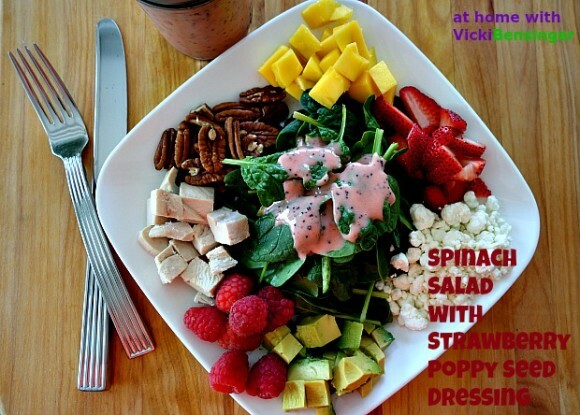 Love all the goodies in your salad plus the dressing sounds divine! It’s also great if you mix all the ingredients with the dressing except the spinach and place in Boston lettuce cups and create a wrap. This is so colorful Vickie and sounds absolutely delicious. I love the dressing, it would be good on so many different salads! I agree Chris, it’s so tasty. I like to use it as a dip as well. So colourful, fresh and packed full of flavours! A great salad, Vicki. Thanks Angie, I hope you’ll give it a try. The dressing is fantastic. I hope you and Mrs. KR try it. I am so making this dressing today. Love how vibrant it looks . Amazing. Please let me know what you think of it after making it. That’s one gorgeous salad Vicki! I’ve put strawberries in a salad but never in the dressing. What a clever idea! And with the poppy seeds, it’s like pouring a poppy seed fruit salad on top of your regular one. Delicious!